Hand Up is growing at a pace where we need help. Keeping our food pantry & storage unit organized and inventoried is critical. We are always involved in projects requiring hands on activities; delivery of food, sorting clothing and fundraising. High School Senior Honor Society students are required to complete a certain number of volunteer community service hours. We welcome these students and guarantee these students learn a lot of social, research and administrative skills. Please email HandUpEnterpriseAL@gmail.com for more information. 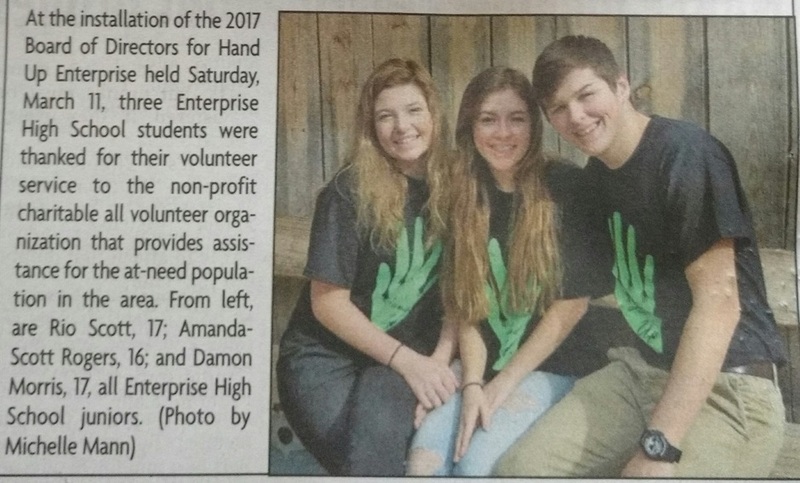 HUE is grateful for the three Enterprise high school students that interned with us from spring 2017 until the end of the school term.